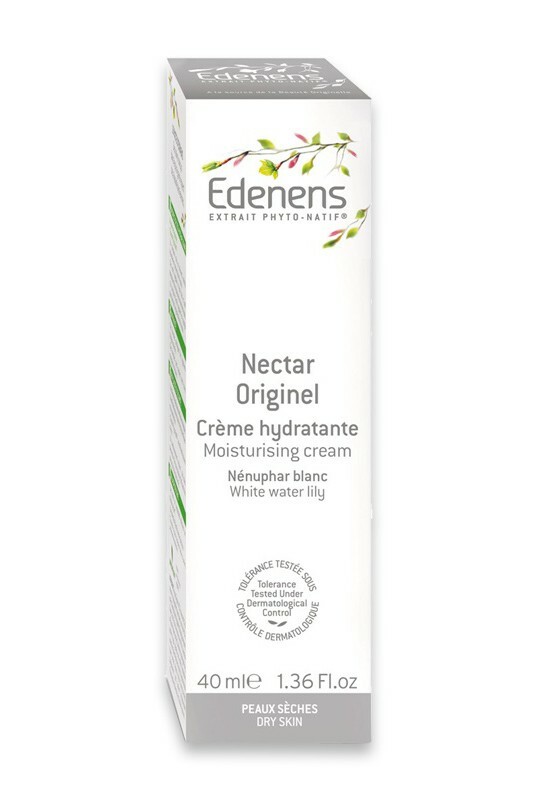 Edenens Moisturizing Cream Nectar Originel geniunely bathes your skin with long lasting moisture* and comfort** : skin is intensely revitalized thanks to the water retention power of White Water Lily. Petals of Calendula give softness to dry and sensitive skins. Phyto-Native Extract feeds skin cells with essential nutriments : peptids, amino acids, minerals. Edenens Nectar Originel protect skin from dry-out to bring back its original smoothness. Skin tolerance tested under dermatologist control. * Clinically proven long lasting moisture of superficial skin layers. ** Clinically proven decline of water loss. Une odeur et une texture très agréable. Permet de bien hydrater les peaux desséchées par le vent et la pollution. Efficace toute la journée sans sensation de lourdeur ou de brillance. 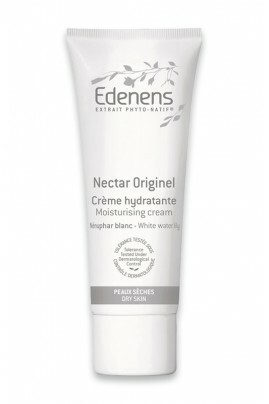 Apply day and night Edenens Moisturizing Cream Nectar Originel on perfectly cleaned face and neck. For intense moisturization : apply the cream generously as a facial mask and leave it for 10 minutes, then wipe the excess with a paper tissue. Aqua, Glycerin, PEG-6 stearate, PEG-32 stearate, Hydrogenated Palm/Palm Kernel Oil PEG-6 Esters, Caprylic/Capric Triglycerides, Dicaprylyl Carbonate, Stearic Acid, Prunus Armeniaca Kernel Oil, Calendula Officinalis Flower Extract, Carbomer, Hydrolyzed Soy Protein, Fagus Sylvatica Bud Extract, Onopordum Acanthium Flower/Leaf/Stem Extract, Nymphea Alba Flower Extract, Alcohol, Parfum, Benzyl Alcohol, Dehydroacetic Acid, Sodium Dehydroacetate, Phenoxyethanol, Benzoic Acid, Sodium Hydroxide.